If you’ve ever wondered about the number of veterans who are employed in the Federal government, know that veterans from all military service branches proudly make up a 30.8 percent of the Federal workforce — or more than 612,000 out of 1,990,033 employees in 2014 — according to Federal government statistics. And it’s a trend likely to continue. The hiring of veterans within the federal government has reached a new high in fiscal 2014, making up 33.2 percent of all civilian new hires. Agencies increased the overall percentage of veteran hires by more than two percentage points last year, up from 31 percent in 2013, according to the President’s Council on Veterans Employment. 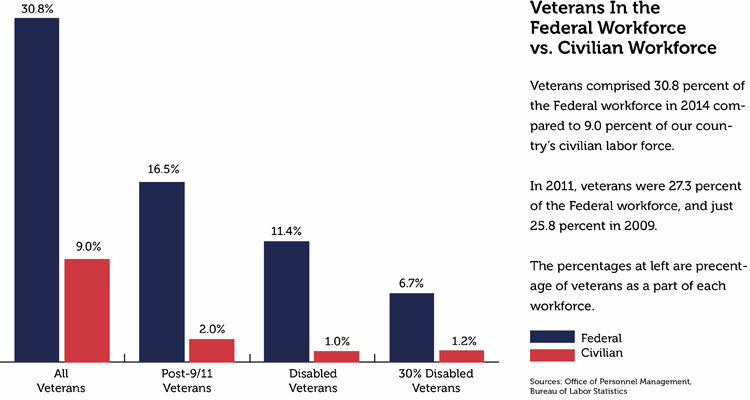 In 2009, veterans comprised just 25.8 percent of the Federal workforce. The Federal government is the lead employer (ahead of manufacturing, professional, education and retail), employing more than 21 percent of male veterans and nearly 30 percent of female veterans. The Federal government is also the lead employer of disabled veterans with more than five times the number of disabled veterans employed by the Federal government than any other entity. While the number of veterans employed is one important measurement, ensuring that veterans continue to excel in gaining Federal employment and advancing through the Federal workforce are important objectives, too. The most recently available data from the new hires in fiscal year 2014 continues an encouraging trend and supports the knowledge that Federal agencies offer many opportunities for veterans. 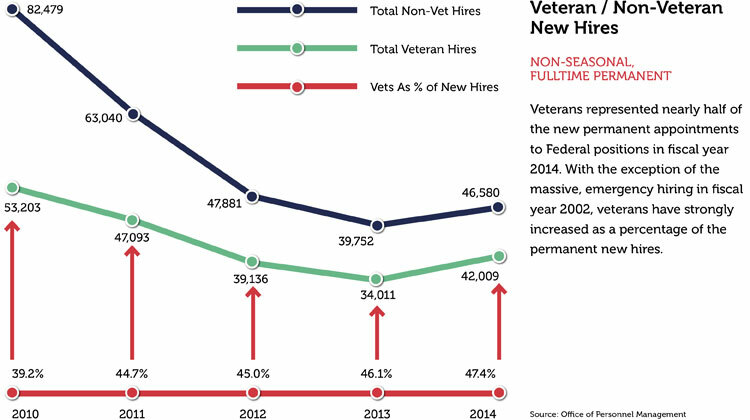 As this chart and the one that follows indicate, veterans are a sizeable percentage of the new hires each year. While the total number of new hires has been declining since the peak in fiscal year 2002 following the events of 9/11, the percentage of new hires who were veterans has been increasing. While the total number of new hires is important, a more important indicator of the strength of the hiring of veterans is the number of veterans who successfully compete for permanent appointments. 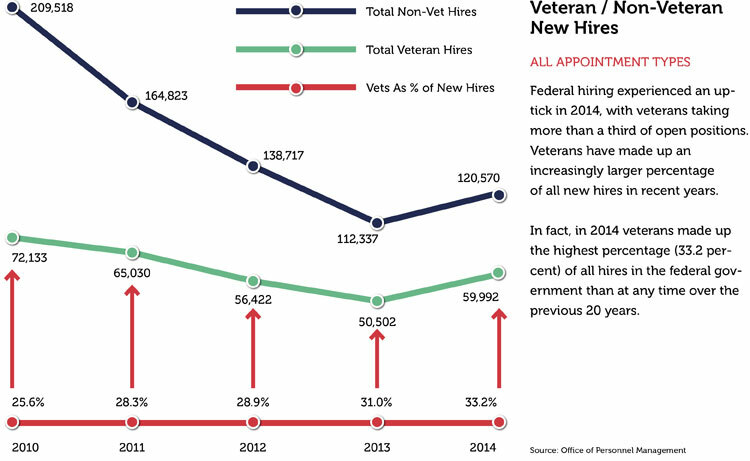 Veterans represented nearly half of the new permanent appointments to Federal positions in fiscal year 2014. With the exception of the massive, emergency hiring in fiscal year 2002, veterans have strongly increased as a percentage of the permanent new hires. While obtaining a job is important, ensuring that veterans are competitive for quality jobs, jobs with futures and competitive salaries, is also essential. Even though veterans are not evenly distributed among the various categories of employment, veterans are a significant percentage of the occupational categories with the higher salaries and opportunities for substantive careers and advancement. The chart below breaks the Federal workforce into six major occupational categories. Even though veterans are only 14 percent of the Professional category, which earned the largest average salary in March 2008, veterans represented 27% of the Administrative category, which had the second highest average salary in March 2008. As the largest occupational category in the Federal government, many of the jobs in the Administrative category represent jobs with skill requirements comparable to the skills obtained in military occupations, such as, logistics, administration, finance, and human resource management. Veterans have risen to the highest levels of the Federal government and demonstrated their continued commitment to country through public service. While veterans have excelled in acquiring jobs and in obtaining some of the best jobs in the Federal government, noting which agencies also provide the greatest opportunities for veterans is crucial. The following profile of veterans in the Department of Defense components and agencies, and the other 14 Cabinet-level departments is also instructive. Which agency or department would you like to work for? 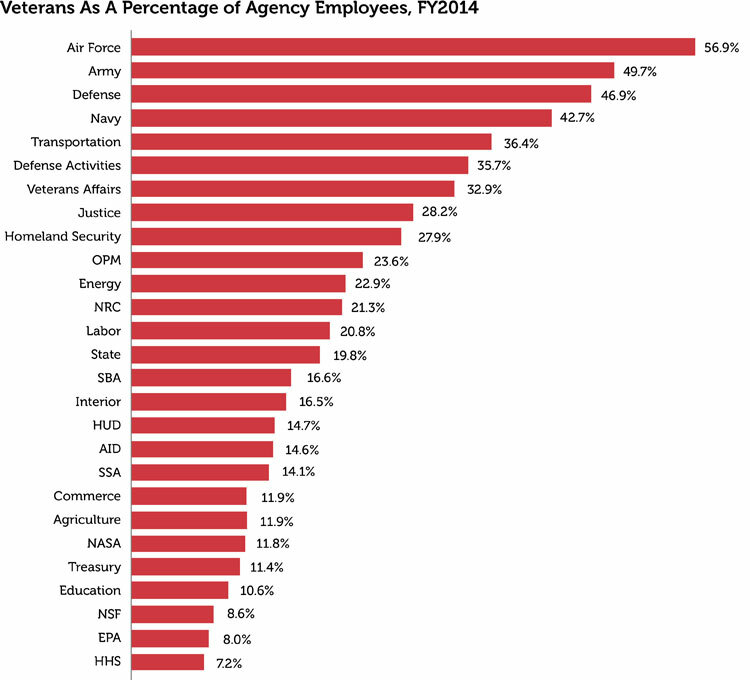 Which agencies or departments have higher percentages of veteran employees in their workforce? While the skills many acquire while serving in the military have many comparable civilian jobs in both the public and the private sector , the military services, and a few other agencies, such as the FAA in the Department of Transportation and the Department of Veterans Affairs, have the greatest number of jobs where military experience serves as outstanding preparation for a Federal civilian career. There are a number of resources that can help guide you in matching your military occupational specialty (MOS) with civilian skills and occupations. As the number Iraq and Afghanistan veterans continue to exit military service, the Federal government will continue to provide many and varied employment opportunities for veterans.